There is at bottom after close to two weeks on the road the only thought to keep moving ahead, when carefully prepared plans are hanging like a stack of dominoes swaying with every burst of wind from circumstances. Ladakh, the gateway to many a imagination, the harbinger of joy and struggle, of peace and tranquility .This is an account of a journey to reach the Roof of this country, to exist amongst the simplicity of the high mountains and immerse oneself in the ever-changing landscape of the Northern Frontier…. For long I have yearned for the magical land of Ladakh “Land of high passes “, that mystical place nestled near the foothills of the mighty Himalayas. One of those places that finds itself in the list of elusive places in this country even today. There have been many who have trudged out there and have come back with tales galore but for me, it was yet to be done .The tale was yet to be written, the wonders were yet to be gazed upon, the cold wind on the face coming afar from the Karakoram up in the north and from across the pangong was yet to be felt …. As days went by it was clear that this was the year when the Northern Expedition would fructify, this was the year when I would feel the Tibetan culture interspersed with Ladakhi hospitality upclose. This was the year when the INDOMITABLE ( My RIDE) would cross into the Land of the High Passes.This is a road account of the journey to Ladakh from the shores of the Arabian Sea. The preparation went on at a steady pace all through the year though in the end it did get a bit sticky yet somehow everything was managed well right from the administrative requirements of the job to the diktats of the DC office at Leh. The INDOMITABLE underwent one of the most intensive and serious maintenance routines of all times, anything that was a suspect was replaced, anything loose was tightened up, anything that gave a hint that it was not up to the effort required was replaced. For me Ladakh could not begin from Day 1 , Ladakh would come when I reach up to it but to do that I had to make a separate journey in itself and that journey began from Mumbai on Day 1 . The target was the capital of the Mewar Kings, the Lake City Udaipur. The journey involved close to 800 kms of travelling using the wide array of National Highways including the National Expressway 1 between Vadodra and Ahmedabad. The major way points on the way included Vapi , Surat , Ankleswar,Barauch,Vadodra, Ahmedabad,Himmatnagar, Udaipr.The road details included the famed NH 8 right from Mumbai till Ankleswar where I exited the same in order to avoid crossing the Narmada over the congested bridge on NH 8 but rather take the historically significant Golden Gate Bridge built in the year 1881 connecting Ankleswar and Barauch. The bridge has seen numerous floods and earthquakes but has stood his ground even after 132 years.This also was the first view of the grand Narmada , fifth largest in the Indian Subcontinent flowing sedately as she moved on towards the Gulf of Khambhat where she would meet the Arabian Sea. Off late I have become closely connected with the rivers that run in our country and she is considered to be one of the five holy rivers older than even the Ganga. The Narmada Parikrama undertaken by many is something to think about as one covers close to 2600 kms walking along the banks from the Arabian Sea till Amarkantank; let’s see what the future holds !!!. The other significant passing note is that one can hold the significance of crossing the Tropic of Cancer near Himmatnagar, for those like me I can now proudly say that I have crossed four of most significant imaginary lines running across the surface of the earth with the other three being the Tropic of Capricorn , the Equator and the Arctic Circle. The thought process this time was to see the Lake city as well prior to proceeding towards Behror which was at a distance of 567 Kms. Accordingly we were by 0800 hrs embarked on our impromptu Udaipur sojourn. Enroute we were fortunate to meet Mr Prakash who was as much a part of Udaipur as the lakes themselves. He literally waved my vehicle down and introduced himself. The deal was quickly worked out and soon we were following him through the winding streets of the city. Our sightseeing included the famed Lake Pichola , Dudh Talai Lake , Karni Mata Mandir and finally we requested that we would like to sample some culinary delights instead of the standard sightseeing monuments to which he readily agreed. Dudh Talai is a dainty little lake on the southern tip of Lake Pichola and if one visits the same in the morning it definitely leaves a mark for its delicate beauty. Lake Pichola , one of the more famous pearls of Udaipur definitely was worth visiting especially when viewed from the Karni Mata Mandir situated on the nearby hill top. The Lake has a rich history and is presently maintained by Taj Group .The Jag Mandir in the middle of the lake definitely adds to the charm of the picture frame as the sunlight gets reflected from the pristine white architecture of Lake Palace and the Jag Mandir. Btw as a noting, Lake Palace a part of the Taj Group has been voted as the most romantic hotel in India and the world for those willing to shell out the big bucks needed to enjoy the romance that is generated out there . After a sumptuous fare of parathas sitting on plastic stools outside the Vintage Car Museum which was thereafter smoothened with a sharp chai in those thick glasses of yesteryears we were ready to say good bye to our guide and philosopher Mr Prakash with whom we indeed did have a wonderful morning. Noon time saw us ready to roll from Udaipur towards Behror. The route involved way points of Chittorgarh , Bhilwara,Nasirabad,Kisangarh,Jaipur bypass and finally Behror. Lunch was definitely in that segment which will remain etched in memory for having being done in one of those places that are a part of the landscape that we were crossing , even now as I close my eyes I can picture the INDOMITABLE standing outside a small open single roof structure with us sitting cross legged on coir charpoys ( u reading it right , I said charpoys and that too coir matted) and with hot rotis being served direct from the wooden tandoor in the background as the hot Rajasthani sun ensured that we kept downing the delicious chaas served. Ahh what to would do if one does not have memories, life would definitely be so bland!!!! It is important to be flexible on road trips, one has to keep this aspect always in mind for disruptions can occur anytime and in any manner .A few words about the Grand Trunk road that we were travelling upon is I feel most essential for it is one of South Asia’s most oldest and longest major roads. It has linked the Eastern and Western region of the subcontinent for over four centuries originating from Chittagong in Bangladesh, entering India through Howrah and then cutting across North India reaching the Wagah Border where it enters Pakistan towards Lahore and Gurjanwala and then entering Afghanistan through the Khyber pass and finally culminating at Kabul, a single continuum of over 2500 kms.As Rudyard Kipling has put it “such a river of life as nowhere else exists in the world”. As one travels through the length of this country one realizes how much there is to see and assimilate. Every small town has a history and a story to tell , there is a place waiting to be explored and spoken about .Ambala Cantt had the army look written all over it and it houses the “2 Corps” one of the three strike corps of the Indian Army. Ambala Air Base is one of the oldest in the country. A small look into the route taken till now , this would involve the start from Behror , then the turn towards Rohtak away from NH 8 , one does this at Rewari .Thereafter comes Panipat , Karnal,Ambala Cantt. After Ambala Cantt we pushed on towards Kiratpur Sahib and thereafter Anandpur Sahib via Mohali. A few words on the Gurudwara Anandpur Sahib which was founded by the ninth guru , Guru Teg Bahadur in the year 1665. The Takht Sri Kesh Garh Sahib is located here, this is one of the 5 temporal authorities of Sikhism. These 5 takhts are gurudwaras which are regarded as having special significance to Sikhism. Sri Darbar Sahib Keshgarh is regarded as the birthplace of the Khalsa.The order of the Khalsa was founded here in 1669 and one is fortunate to see the weapons used by Guru Gobind Singh ji out here. The NH 21; a 323 KM long highway which connects Chandigarh with Manali ,has deteriorated since the last time that I had traveled on this route and I don’t see any immediate repair action or plan in sight, the vehicles trudge as per their capability suffering the abuse that the deteriorated road heaps on them and in return the road deteriorates even further , it is a vicious cycle . We reached Manali after covering a distance of 221 Kms by 1630 hours. This day marked the beginning of the Ladakh sector . Today onwards we would be embarking on the critically acclaimed Manali-Leh Highway. The theoretical literature that I had read would be sampled in all of its technicolour . I had woken up early as I wanted to witness the glorious blaze of sunrise erupting over the peaks of Rohtang and the Solang Valley courtesy the wonderful location of Ride Inn where we were put up for the night. The sun rise did gladden my heart and infuse me with warmth and vigour as I prepared for the day ahead. The path involved Manali , Palchan, kothi,Gulaba,Marhi,Rohtang,Koksar,Sissu,Tandi and finally Jispa. A total distance of 137 km which included the very first pass of the Expedition, Rohtang. The road to Rohtang keeps twisting and turning and it was a continuous play of sunshine and shade. The spirits were up as we kept going higher and higher and soon we reached Rohtang Top . Jispa was reached by 1700 hrs and our destination for the night was Hotel Ibex jispa. The hotel was practically empty barring us and after relaxing with a cup of tea we spent the late evening hours on the banks of the Shyok river which was flowing merrily some distance away shimmering in a shade of turquoise blue inviting and provocative . A walk in the village in the gathering dusk was extremely relaxing. It had been a good day and we were all set for the next which promised to be long , tiring and definitely challenging. What do one say about this most famous of all sections , where the average elevation is 4000 mts and one crosses five mighty passes in a single day , where the vehicle struggles and the driver clutches the steering wheel with utmost dedication all the way , where there is something known as the More plains which is not called as a Highway but rather a Runway and at the same time there is the mountain , tones of it all over which ensure that the steering wheel is never steady but rather moving at all times to keep the tires of the vehicle on the centre of a road that snakes its way through the terrain climbing , falling but moving ahead all the time .This is the land of the BRO and GREF who keep the paths open for people like us to traverse the passes and the lakes . We started from Jispa just as the sun was coming up .The day saw us crossing iconic high altitude lakes like Deepak Taal and Suraaj Taal . We crossed four high mountian passes , Baralacha La , Nakee La , Lachung La and Tanglang La before finally rolling in to Leh city during dinner time. The day was to be spent doing primarily administrative stuff and couple the same with a visit to Leh Palace and Tsmego Namgyal Gompa and Shanti Stupa. Accordingly we were up and headed for breakfast at Gesmo Resturant on Fort Road which is a must visit and highly recommended. My recommendation is to visit the in and around places near Leh town and go easy on the body acclimatizing it to the high altitude. There is shopping to do in the local market , visit to monasteries , palaces or just soak in the views . Leh town was in deep slumber as we made our way through the streets towards the exit from the city. The period before the onset of the dawn is the blackest of the entire night and so was the case here with the sky black as ink. Deskit though was quite a way off, first coming up was the famous Khardung La, the pass of the million flags. He definitely made the list of being amongst the celebrity passes in this country. The climb started almost immediately after Chagspa as we exited the town. The winding road lay ahead shrouded in darkness and in between flickering moving lights gave us the indication of similar travelers who were on their way towards Kahrdung La. The first rays of the sun soon struck gold on the towering peaks of the Himalaya and mortals like us stopped in our tracks to gaze in awe at the creation of nature being unfolded. Khardung La was reached by 0730 hours and it was super cold and empty, we were thankful for the empty place. We were met by few army jawans who were present and had a pleasant discussion with them. Khalsar, a small village with a sprinkling of shops was reached by 1130 hrs and thereafter we took a turn towards Deskit instead of heading on the northern arm which lead to Panamik and Siachen Base Camp, more on that route in the next post. Soon we proceeded ahead and reached Deskit . As soon as we approached Deskit, we were astounded by the beauty of that place, the serene and pristine atmosphere was so inviting.The scenic beauty was so captivating that we ended up staying the entire day out there , found a great Home stay named Sonam GH. The afternoon was spent in the village of Deskit followed by a visit to the Deskit Monastry where we were fortunate to enter into a conversation with one of the senior Lamas which ended up with an invite to this place within the monastery for the evening tea. In the fading light we went to the sand dunes of Hunder and relaxed ourselves amongst the towering mountain ranges above us and the cold desert beneath our feet. This day was one of the red lettered days in the whole trip. This day we were supposed to go right up to the Siachen Base Camp. However whether we would be allowed to reach one of few elusive places within Ladakh Sector, that would be decided when we reached the TCP @Sasoma. The morning was not very encouraging as I was able to see a huge dust storm in the horizon on the mountains and the cloud cover was grey and dark like it was snowing in the general direction of where I was supposed to be travelling. The GH owner assured me that the day would be a clear one and these occurrences were common. Accordingly we moved towards the Deskit Gompa where we wanted to take part in the morning prayers .We assembled in the main prayer hall by around 0615 hours and took our predetermined place normally reserved for the guests. Soon the monks started coming in and each had its own determined place. Each monk firstly payed his respect to the idol of the Padmasambhava and thereafter took his place. The seating was in line throughout the length of the prayer hall with a desk in front on which the sutras were placed which was supposed to be read collectively. Once everyone had assembled, the butter lamps were lit and placed in front of the idols of the various forms of Lord Buddha .Young monks distributed salted tea to all including us which was really delicious .The prayers started soon after and the hall reverberated with the deep throatings of chants and the glow of the butter lamps, a sublime atmosphere indeed. The visit to the Siachen War Memorial will remain etched in memory.The solitude was truly epic and with towering mountains on either side I felt very apprehensive driving through with the fear of imminent rock fall was ever present. Till date I have rarely been apprehensive or worried with fear but yes on this road I was.. The fear of the unknown and getting stuck in one of the loneliest stretches ever seen. The vistas were truly inspiring with raw power and beauty. Base camp was reached and there we visited the various troop formations stationed, payed homage to the shrine of OP Baba, the guardian angel for the troops who trek to the glacier. and so will be the visual of the glacier from where the trek starts for the troops. The black ice melting in the afternoon sun forming rivulets of glacial streams was quite a revelation. Base camp was truly a different world, sadly not everything can be written down in public forums but a visit to a place like this is worth something much more tangible. The dawn of a bright beautiful cold day in Northern Ladakh and yet another challenge lay ahead of us .It is these challenges in the trip which made it so special when I look back into the past . Today was the climb to Wari La. So what is special about Wari La, well am sure many would definitely relate to this pass but then a greater number would actually not !!! Not much is written about this pass in the internet barring few accounts documented by those who have crossed it . For the uninitiated like me crossing this pass is like an act of self gratification and personal achievement. To have been to a place which has so sketchy mention and remains elusive even in this day, is worth more than numerous trips to places which are much more pretty and scenic but easily reached. Will the Indomitable, a sedan be able to make this pass, again I had no documented record of this so there was no comparison that I could draw. Only SUVs had done this or maybe bikes. The scenic beauty of the route which lay in the shadow of the mountains was incredible with patches of yellow vegetation interspersed with green brown and blue topped with white snow. The climb had begun and I was moving along at a sedate pace conserving the engine temperature and making it steady preparing for the long steady climb ahead. The bane of this pass is the continuous gradual climb which is relentless and does not even out even one bit . Hence the difficulty in reaching Wari La.One crosses the elsuive and least visited Tangyar Monastery out here where the monks live out their days in complete seclusion. The scenic beauty was worth the trouble that I was taking and the strain that the INDOMITABLE was undergoing and by 1130 we were at Wari La with the last 5 kms totally snowed out however the Michelin XM2 held up very well and with the extreme slow speed I was able to manage the traction to move ahead. The feeling of standing at Wari La slowly sunk in as I sat down next to the Indomitable and looked around at the snow covered mountains at all sides with the cold wind on my face. After spending some time and allowing the engine to cool down we started our descent towards Sakti. The going was totally downhill as we moved on a extremely narrow path hugging the mountain. From Sakti I headed into Eastern Ladakh towards Pangong and then Hanle. The road to Chang La was quite decent and we were able to make steady progress, numerous army convoys were crossed and the afternoon sun bore down quite strongly. Chang La was reached by 1600 hours and we spent some time at the Chang La Baba shrine .Thereafter we were on our way towards Tang Tse. The night was pretty cold and I realized the drop in temperature that we were going to experience as we continued out path towards Eastern Ladakh right on the periphery of the International Border. The Guest House was very rudimentary and this was how it was going to be in the days to come. Our route for today was along the Pangong Lake Road towards Lukung and then onwards to Pangong. I wanted to spend a complete day at Pangong including the night unlike a day trip for a couple of hours. Pangong had to be befriended in a stately fashion. So soon we were speeding on the road ahead and I missed the Tang tse Gompa completely having not realized its importance. The 800 year old Gompa clings to the walls of the mountains and is very colourful to look at . Also known as the Skoba Jigstan Gompa. The sun was up and the morning was splendid even by Ladakh standards , the golden vegetation on the mountains coupled with the multi hued coloured rocks and eternal blue sky provided a feeling that infused one with vitality towards life. In around an hour and half I was at Chiagar Tso. This jewel of a lake on the right side of the road is passed by many in their hurry to reach Pangong however it is prudent to spend some time here and soak in this beauty. The lake has the capability to mesmerize and I definitely suggest a stop here. 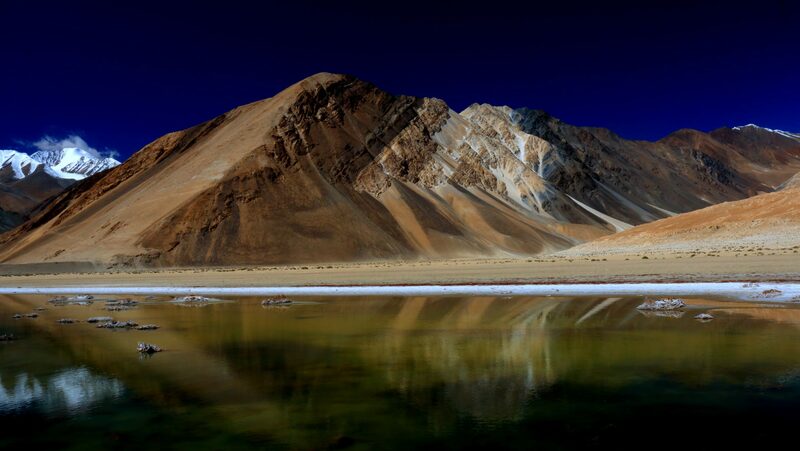 At the vehicle Odo 75590 I witnessed Pangong , the lake of ethereal beauty. There will be many lakes in this world which are far more beautiful than Pangong but when one is at Pangong he never remembers the image of any other lake existing in this universe; such is the pull of this lake. Pangong Tso which in Tibetian means the “ Long Narow Enchanted Lake” is a 134 km long lake which is situated in the border between India and Tibet. The lake is a disputed territory and the LOC passes over the lake. The entire day was spent on the shores of the lake taking in the beauty of Pangong and admiring the vistas that kept changing. Lunch was done with the water of the lake lapping at our feet and gull flying overhead. Anyhow we turned back and retraced the path towards Spangmik. Afer Spangmik I gunned the INDOMITABLE towards Tangtse as we had to reach there and then turn towards Erath. After a agonizing 17 km I finally was clear of the under construction sector and came across something of a beauty – Harong Wetlands.This is a marvelous high altitude eco system and sustains multiple plants and birds who co exist peacefully. The beauty of this place was such that in spite of my tearing hurry I could not make haste and spent close to 30 minutes just soaking in the pretty picture of herds of Yak grazing on the yellow vegetation under the cover of snow cloud mountains while geese and other aquatic birds played in the glacial streams .It was the setting of a perfect idyllic morning and if I was not destined to cover such a large journey I would stayed at this place for the day itself. After a short break of 10 minutes at Chushul and showing our permits to the Indian Army personnel at the TCP we proceeded ahead towards Rezang La . From Chushul the route to Hanle comprises of two sections , the first is the totally dirt track through extreme wilderness along the Rezang La and Spangur Gap which mark the fringes of the LOC with China. This sector continues till Tsaga La after which we reach the village of Chagga where we meet the tarred road which then continues all the way till Hanle. Firstly about the route till Tsaga La. This route is one of the few remaining total wilderness routes when it comes to tourists, with no road except a dirt track made by the vehicles which ply on these paths, one has to be careful while transgressing this route as there are no markers to indicate just about anything .One can see the bunkers of the Indian Army on the right who stand guard the safety and sovereignty of our country against possible incursions from across the border. On the left the Rezang La mastiff rises and acts as the natural barrier for the LOC. It was here that the 1962 war was so fiercely fought and lost. The memorials at Chushul and at Rezang La bear testimony to the sacrifice and valor. There are no grand monuments constructed by the grateful nation in recognizing the sacrifice, no wreaths laid by National Leaders to commemorate the sacrifices , its only the Indian Army who still remembers and honors those who were a part of the family and are no more . Very poignant thought but that’s the reality in this country of ours. Tsaga La was reached by 1550 hrs and thereafter we crossed the ITBP TCP and for the first time in many hours stepped on smooth tarred road. The Indomitable roared ahead and we were on our way and what a change of scenic beauty , multicolored mountains welcomed us as we sped on our way towards Loma Bend which was reached by 1700 hrs. The distance of Hanle from Loma Bend is 55 km and immediately after the bend there is a bridge , beyond the bridge there is a V junction. The left takes one to Fuckche while the right goes to Rhongo and then to Hanle . The road surface is as smooth as the More plains and we were speeding on our way in the setting sun as it has been a really long day and wanted to reach Hanle before the sun set. So here we were at the extremities of Ladakh away from the hordes of tourists who come tripping to Ladakh , here we were among those who actually inhabit this wonderful land and live their lives in peace. Today was going to be another special day amongst all the specials till date on this trip . Today I was going to visit the twin lakes of Ryul Tso situated down south of Hanle on the route to Thit Zarbo La. The route was a cracker and the INDMOITABLE was definitely out of its league , here I was going to depend on the work horse of this place a.k.a The Tata Mobile 407. The GH owner Mr Sonam agreed to accompany me and soon on a cold morning with a packed lunch we were on our way to see the twin lakes. The route involved was not on the map and was a track made by vehicles which play, a thorough knowledge of the terrain is a must out here especially the initial Kms were pretty torturous. The Tata Mobile was up to the task and very slowly in gear I & II we proceeded ahead up and down as the track led us. The twin lakes Ryul Tso and Chilling Tso are around 40 Kms from Hanle and further along the route one can reach Thit Zarbo La. This is total Changspa Country and one has to keep in mind that the sheep guard dogs are not very welcoming to strangers and once they get their jaws in, it is only the master that they will listen to. Soon I reached the twin lakes and after spending some time in splendid isolation I decided to also travel till Salsal La which lay on the route to Chumur , this is a diversion from the path that we were on and soon we took the diversion and proceeded ahead. We reached Salsal La by around noon and had a great lunch out there followed by some hot tea. One of the very best moments in my life. The road ahead proceeded to yet another pass known as Shongdong La and thereafter to Chumur. But that was left for some other day , we turned back from here and proceeded back as I wanted to visit the Hanle Observatory too. Overall a great day and I loved every bit of it . I think the visuals will speak for themselves with regard to the beauty, the isolation and the magnificence of what I experienced. In this trip I left out three major sectors and these are Tso Moriri , Zanskar , the lakes around Eastern Ladakh and two main passes which are Marsimek La and Photi La. These could not be covered owing to a variety of reasons. Today we had decided to visit the gompas near the city of Leh. Accordingly got up late as we had no fixed agenda. Breakfast was once again at Gesmo Resturant , simply loved the breakfast out there. After a lazy huge breakfast mandatory shopping was undertaken which is unavoidable . By around eleven we were on our way to Hemis Gompa. The gompa situated around 42 km from Leh can be reached from Karu. Established in the 16TH century, the Gompa is dedicated to Lord Padmasambhava. The recently renovated museum houses rare artifacts, thangkas as well as scriptures from the age of Buddhism and is worth visiting. There is a nice book shop too that is a treasure trove for books related to Buddhism. After this we visted Shey Gompa , around nine kms from Leh .The monastery sits atop a hill and houses the 12 Metre Sakhya Muni Buddha statue which has altar lamps burning which burn all year round .The Tara temple also is worth visiting within the premises. It was evening by when we were done with our visits and had a leisurely walk in Leh town .Tomorrow we began our run to Kargil, for now it was just strolling in the streets of Leh. As mentioned earlier we had decided to not venture into the zanskar region this time even though I had studied a great deal on it. It is important to be mentally positive when attempting a drive into regions like the Zanskar and it has to be mutually agreeable by all those who are doing it . #So we left Leh early and were on the brilliant NH 1D as we sped away on towards Kargil.Our first stop was the spiritual Gurudwara Panther Sahib , constructed 25 km away from Leh built in memory of Guru Nanak Saheb , at a altitude of over 12000 feet. The history of the gurudwara is very special and speaks about the aura of Guru Nanak and has the famous story of his visit to the Ladakhi region entwined. The famous boulder on which the impression of his back and shoulder is embossed is a sight to see. We had the famous langar at this most holy of all places and the simple meal was for me the most important of all till date. We had a great run and we reached Srinagar by late evening and finished for the day . This was the time of the Srinagar floods hence we decicd to take the Moghul road to reach Jammu.. The route involved pulwama , shopian, bafliaz and then ahead on the Mughal Road. I followed the taxi till Shopian . From shopian a bit ahead one reaches a intersection and one has to take the right road which will lead to the start of the Mughal Road which is one of the most spectacular roads ever built anywhere in India as it races through the mighty Pir Pangal Ranges. The condition of the road was mix of good and bad and it was incline or descent all the way. From here on there is nothing much to write as we were on the return leg and were on the great Indian Highways .Hope all of you enjoyed reading my experience , thank you . Drive carefully, that is the need of the hour. Ladakh can be seen in different packages, this is one version of it. The Homestays are basic and rudimentary, though the situation has improved but then these have a charm of their own. Do the paperwork correctly especially driving documents, ILP and DC office permit to avoid passage issues through a particular place. Locals are friendly and just ask for directions in case of doubt.